With the Beast in Cruiser hospital in Nairobi, I am concerned with a couple of things; one, I might need to scrap my steed (heaven forbid, but a definite reality) and two, even if I did get it back, it would take months to repair and I might not have the time to see everything I had planned to. So I decide to flush away a substantial part of my life savings and book a package deal to the Mara. 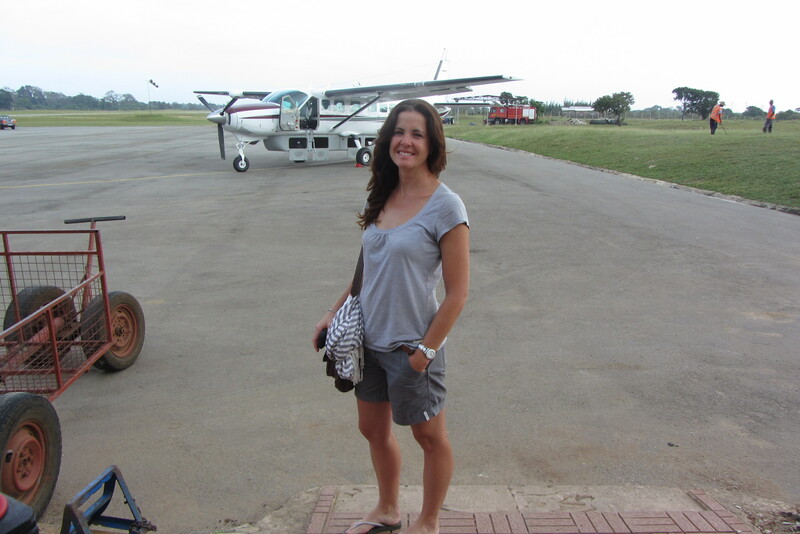 Love flying – always a pleasure! We touch down on the Governor’s airstrip and are met by safari vehicles waiting to whisk us off to various lodges. It has just rained and stepping off the plane, that bush smells so good. 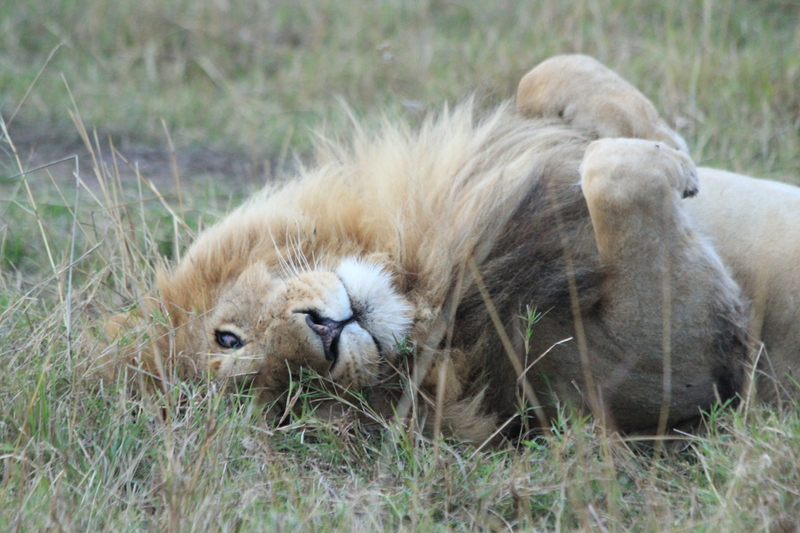 Two minutes into our drive to the lodge, we happen upon a pride of lions, lazing about in the grass. Just like that! It’s almost as though the scene is staged; the lions walked over in the morning before the first plane gets in, tethered with invisible bits of leash to quench the arriving clients’ salivating hunger for the perfect introductory photo opportunity. 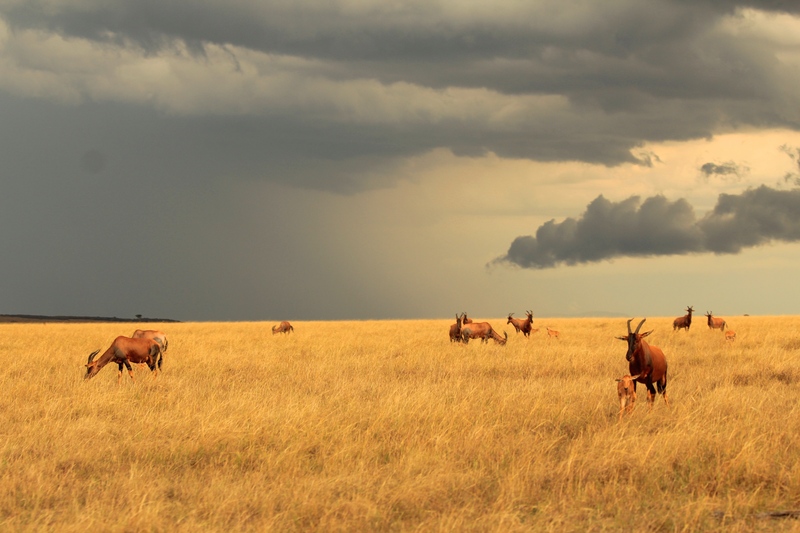 But obviously this is not the case, this is simply how it is… this is the Maasai Mara! 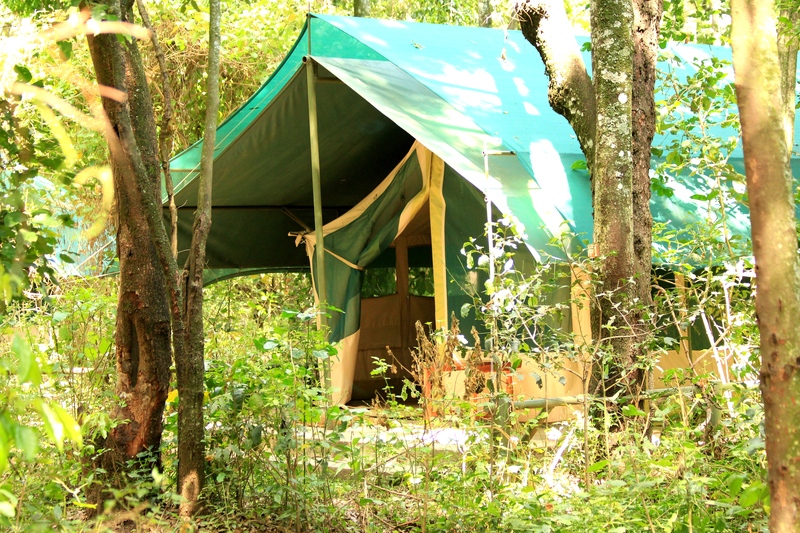 Governor’s is a beautiful private camp built on the Mara river. The rooms are massive safari tents set on permanent structures, and a look inside reveals a massive bed, stunning bathroom and more space than you could swing a cat in (even a large lion size cat). The whole thing is absolutely exquisite and far too lush for one so travel-worn. I set my rugged North Face bag down on the specially hand-carved and delicate luggage holder and take a look around. Twelve safari tents line the Mara river and a simple wooden beam barrier separates us from the beasts that roam the river and bush beyond. A short walk down an overgrown path leads to a bar and dining area under cover. It’s lunch time and today the chairs and tables have been creatively arranged under the trees in the shady breeze for our dining pleasure. It’s all inclusive so I unashamedly tuck in to just about everything on offer. Our afternoon game drive leaves at 2pm and I get ushered to my driver and fellow game drive viewers; two very sweet Japanese ladies who do a lot of smiling and head nodding, and a wonderful lady from Switzerland called Heidi (well of course). Our driver heads out with us bouncing about in the back of his modified Land Cruiser (a spartan counterpart). 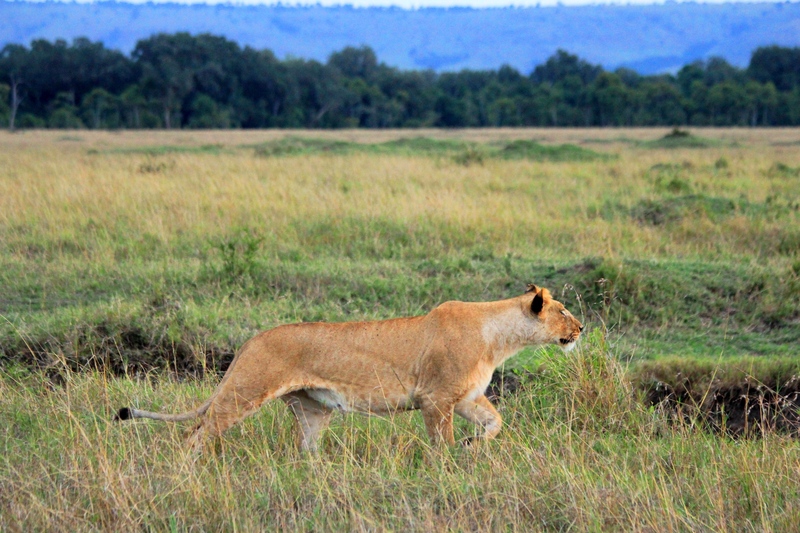 Our first sighting is a lioness on her own, chilling in the grass. We can see her just perfectly from the road but that’s not close enough for our maverick driver who pulls a hard right, wheel spins off the road, crashes through the bushes and hauls hard on the the handbrake as he slides in right next to her (like a glove). Maneuver complete, he cuts the engine, places his right arm on the window ledge and in the wake of the dust cloud, gives himself a self-approving nod. Not a fan of upsetting the animals, this kind of upset me. 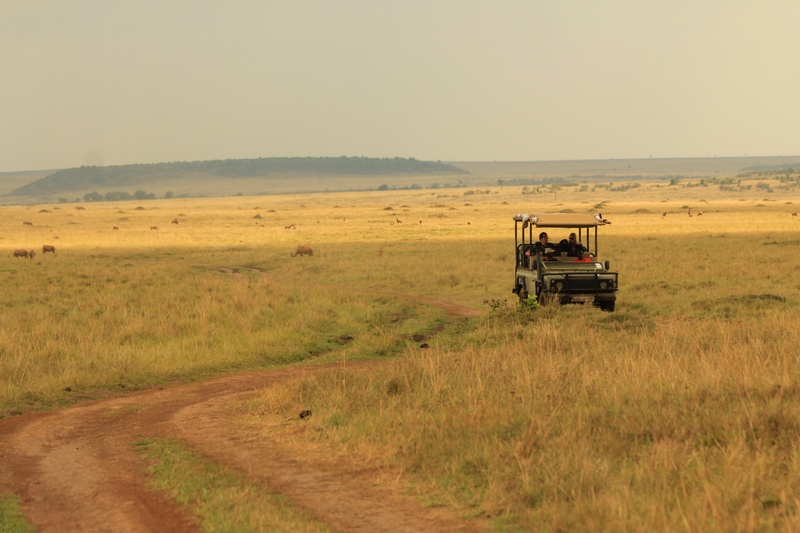 It’s incredibly open here and the grass plains stretch to the horizon so spotting animals is a little too easy at times. We pass herds of Topi, an antelope I had not seen before, most of them with a calf at their side. Our careless driver is gunning it down the dirt tracks and almost takes out some of the herd. Heidi gives out a small shriek and we ask him to slow down, which he does for the next two minutes until he spots a cheetah off road and the fast and furious joyride through the bush repeats itself. 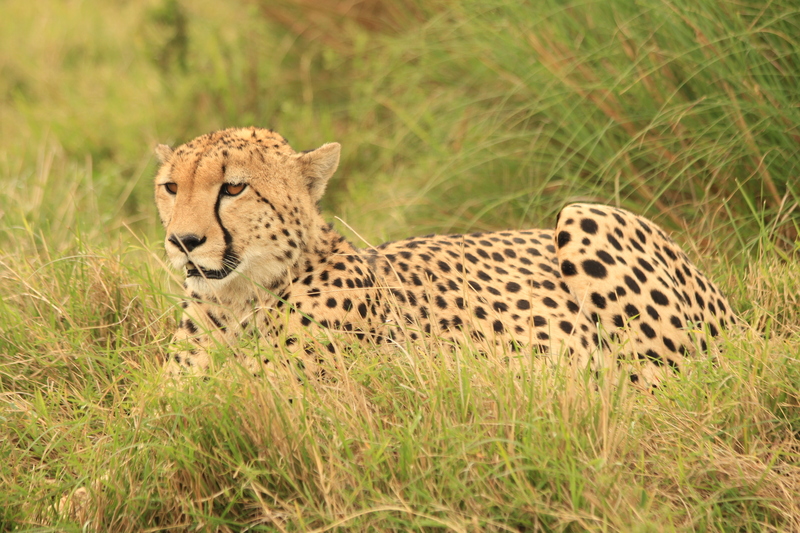 Before we know it, we’re about a metre from this cheetah who has her head upright, ears flat against her head and eyes wide as saucepans as she watches us charging in. Eventually she calms down and continues to lick herself. What luck! Two cats in the space of about an hour, super chuffed! We head off to a point in the river which is notorious for migration crossings. My earlier doubts about having missed the crossing were completely reversed when the rangers informed us that the migration had indeed come through early, but the tail end had come back for some reason. A month earlier and I wouldn’t have seen a single wildebeest at all. The skies continue to get darker and before we know it, we’re in the middle of a massive storm. The wildebeest train that had been heading for the water, does an abrupt u-turn and starts trudging in the opposite direction. We pull down the canvas side flaps and sit miserably as the wind blows rain through gaps in the canvas and drains onto us in long strings of cold water. 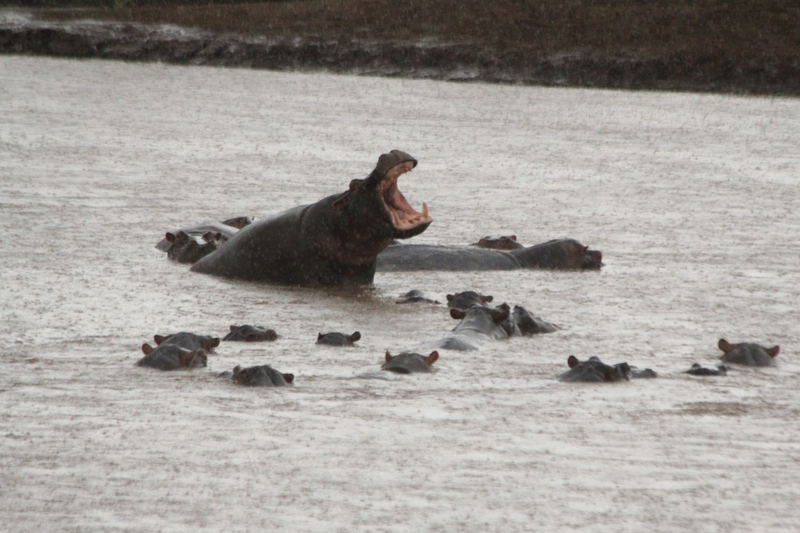 The hippos in the river next to us are in their element, play fighting and grunting in the downpour. A young hyena emerges from the grass after a storm. Eventually things subside sightly. We start up again and continue our game drive. 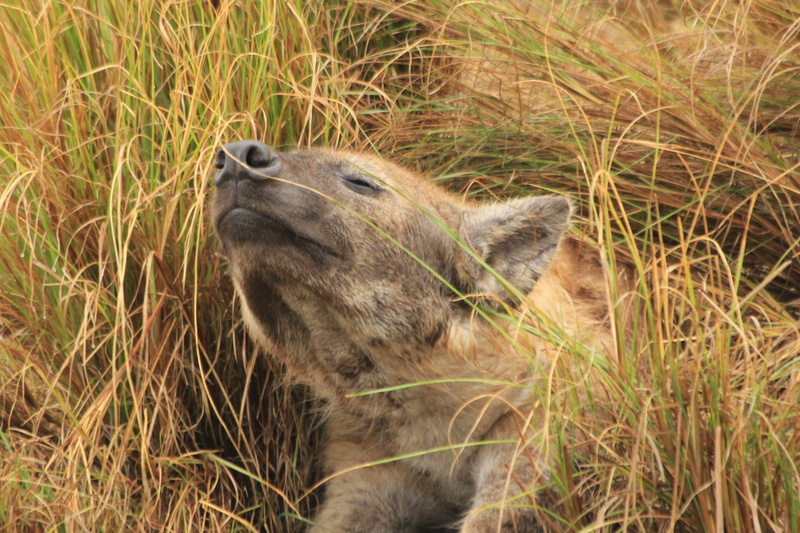 We come across several soggy hyenas lying huddled together in the long soaking grass. They seem too cold to even notice us. 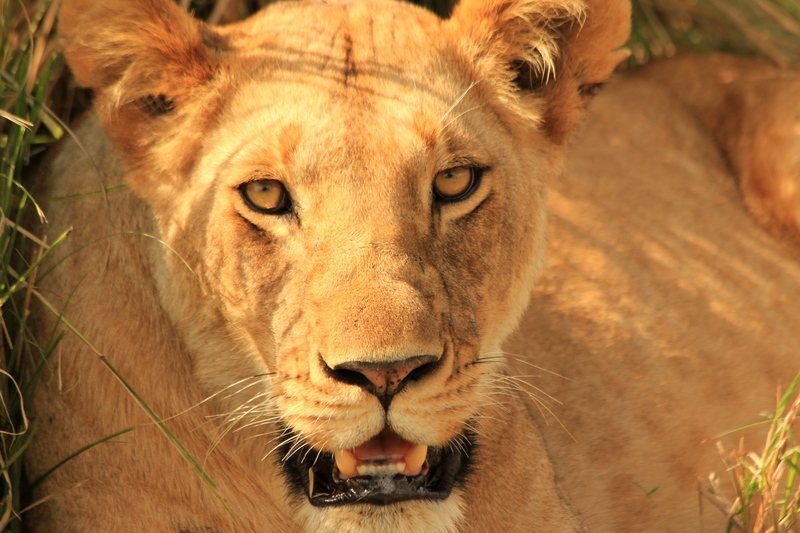 Nearing the end of our chilly drive, we find another lioness and she’s crouched ready for a hunt. I spot an unsuspecting warthog on the other side of a large ditch and reckon he must be the one with the target on his rump. We watch her stalking for a while, the warthog gets wind of it, and it becomes too difficult for her on her own with the ditch in her way. She spends the next five minutes creeping up and down the ditch whilst the warthog watches her from above, basically giving her the finger. Eventually he just trots off and she gives up and sits sulking on a mound. We pass another group of lions on our way back into camp. This is the Marsh Pride and daddy is a fighter. His right eye has been damaged over a number of years, defending his position as alpha male and it’s clearly not getting any better. He scratches it with his paw whilst we watch and I cringe. It looks so damn sore! It think the rangers call him Scarface. What a successful drive it’s been. Heidi and I have dinner together, she’s traveling alone too so it’s great to have the company. It’s 6am the following morning and I hear a soft voice, “Morning Madam”. It’s Charles, my ‘chalet host’ bringing me a coffee wake-up call. This is standard operating procedure in the morning whilst you wake slowly from your slumber; Charles comes into my tent, turns on the small bedside light and sets up a small table next to my bed. He lays a mat over the table and places a plunger of coffee, jug of milk, sugar bowl and two biscuits on the saucer. He quietly slips out, like a ghost in the darkness, before I’m really aware he’s been there at all. How lovely! I have my coffee and get to the truck at 6:30am for our morning drive which starts off incredibly well. 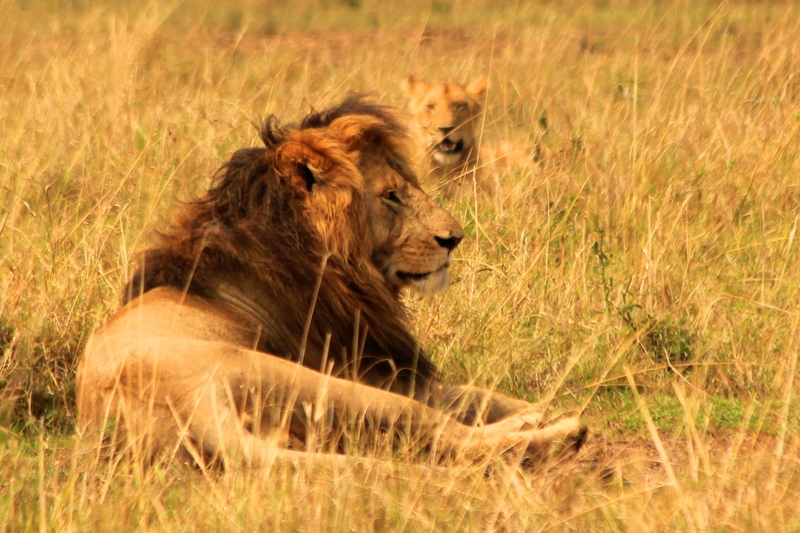 Not far from Governors at all, we come across a lion kill with the young ones still attacking the carcass. An unfortunate wildebeest has met it’s demise at the claws of this hungry pride. It looks like daddy’s had his full, he’s lounging around (typical). Mum comes over and gives him a whack across the head with her paw (typical) and the teenagers are all fighting over the bloody scraps (typical). 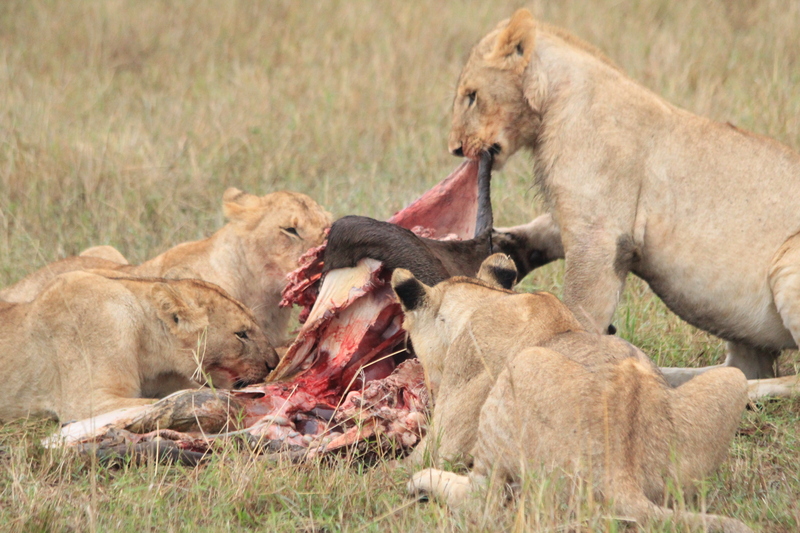 The cubs tear their wildebeest meal to shreds. Our driver gets some sort of call on the radio and before we know it, we’re racing rally-style across the plains followed in close pursuit by a dozen other vehicles. I expect the wildebeest are about to cross at some point on the river. The cavalry arrive and skid to a halt, quite a way back from the side of the river. The drivers have to wait as far back as possible until the first wildebeest takes the plunge and once the flow of swimming beasts has started, they can all move forward. 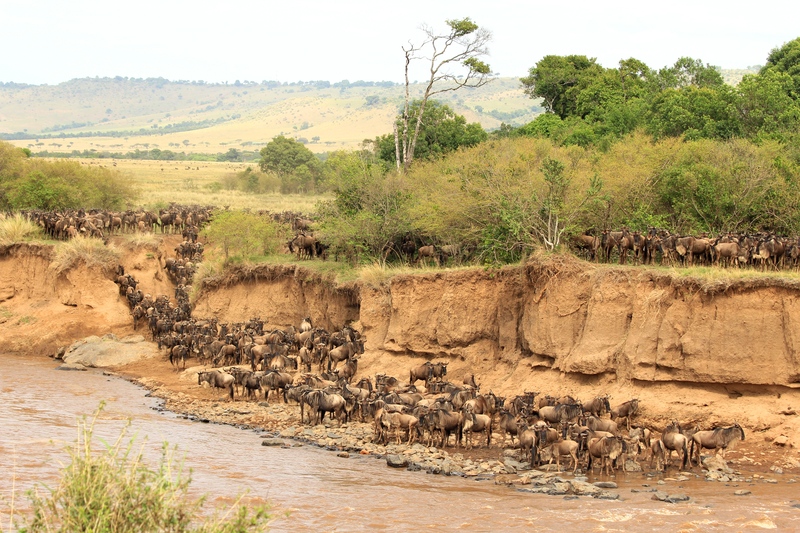 Hundreds of thousands of wildebeest pass through the plains of the Maasai Mara and Serengeti each year. We wait, camera’s ready. I have my SLR Canon big lens for photos as well as my small Canon on video, poised to capture this momentous event, and we wait. A group of wildebeest trot down, nose the water, get skittish and flee back up the side of the river. A single wildebeest gets brave, trots down to the waters edge, gets skittish and flees back up to the group… and so it continues… for two and a half hours! Most of the other safari vehicles have left and we’re one of a handful that remain. Risky business avoiding crocodiles during river crossings. 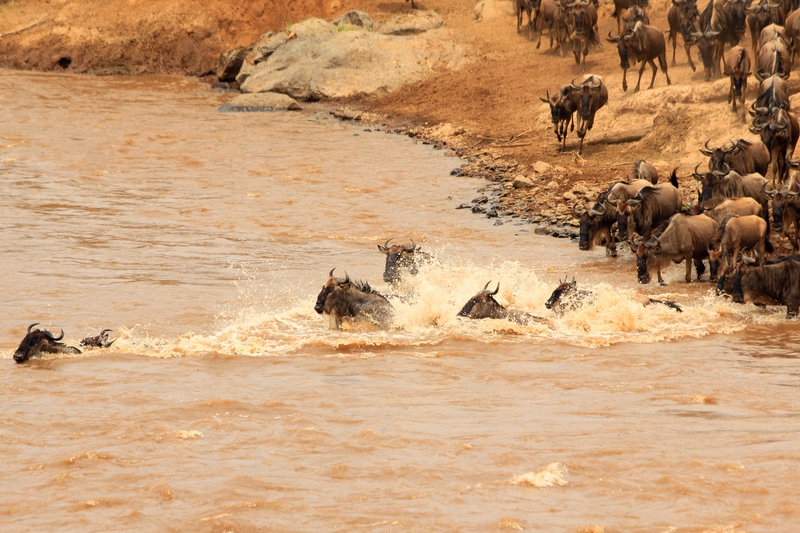 Eventually (and maybe he was pushed), one wildebeest takes the plunge and the flow doesn’t stop. One after the other they follow, hurling themselves into the river, swimming as fast as their little pin legs can go, and pushing up the other side in between all the safari vehicles, and onto the plains beyond. A few zebra join in. They’re the smart ones, waiting for the wildebeest to start the process before taking the risk themselves… Unfortunately, this is an unusual crossing point so there were no croc attacks and I’m surprised that not one wildebeest broke a leg as some were jumping down from the steep banks on the side. Simply incredible. Not one carcass at the end of it all! This incredible natural migration movement is what I’d come to see, and by the most amazing stroke of luck, I’d seen the best part! 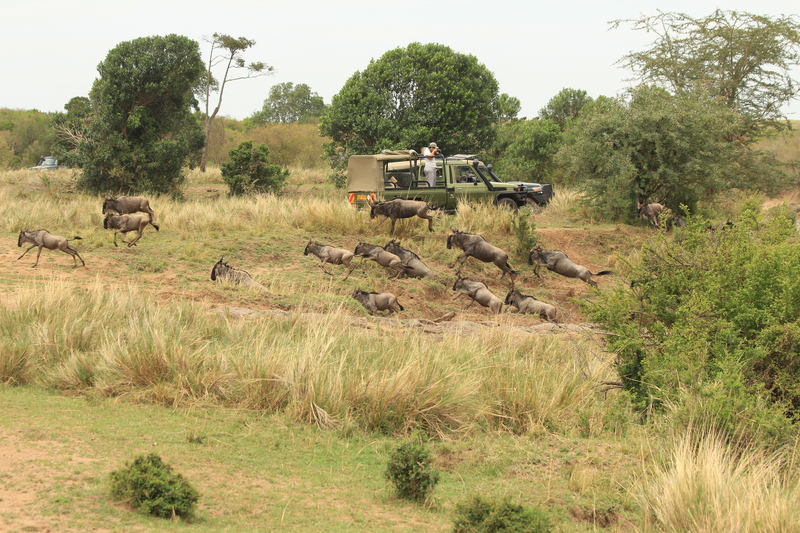 Safely on the opposite bank, their march on to sweeter grasslands continues. Heidi left camp after lunch to catch an afternoon flight out to Zanzibar and so I joined the two Japanese ladies again that afternoon for another game drive. You get to a certain point with game parks, once you’ve seen a migration crossing, a lion kill, a lion stalking it’s kill, more lions than you know what to do with AND a cheetah, an average game drive just seems like a bit of a waste of time. How spoiled am I? We see more elephants and pass a hyena den full of mums with pups, but the heavens open up again and so we head back to camp a little earlier than usual. With Heidi gone I’m dining alone this evening. Half way through my cordon bleu a lovely man comes over to ask me if I would like to join him and his company for dinner. He’s caught me with my mouth full and so I politely decline from behind my serviette and tell him I’ll join them for coffee at the end of my meal, which I do. I hadn’t realised initially on sitting down with this group of four, that I had joined the managers Philip and Kate, along with their balloon pilots Sanjay and David. What awesome people! Before I know it, I have forgone my 6am game drive and am being woken at 4:30am instead, this time by Charles who comes flying into my tent following a massive commotion outside. Elephants have completely destroyed the barrier between the river and the tents, and Charles and the guards have spent the better part of 15 minutes trying to get to us to wake us up. Charles stays with me in the tent until the rangers have chased the elephants away (apparently Doom bug spray works best?!). So up at 5am, waiting for the coffee to kick in and eyes still at half mast, we drive a short distance to Little Governors and take a small boat across the river. The balloon launch site is just past the Little Governors camp and as we come around the corner, two massive balloons lie deflated on the grass. I stand and chuckle to myself at the obligatory safety briefing, given by David Chipping in the queen’s best English – health and safety is high on the agenda (as you can imagine). All I take from it is the part where we have to sit down and hold on for the landing. I’m not going to hop out the basket in mid air so everything else seems trivial. 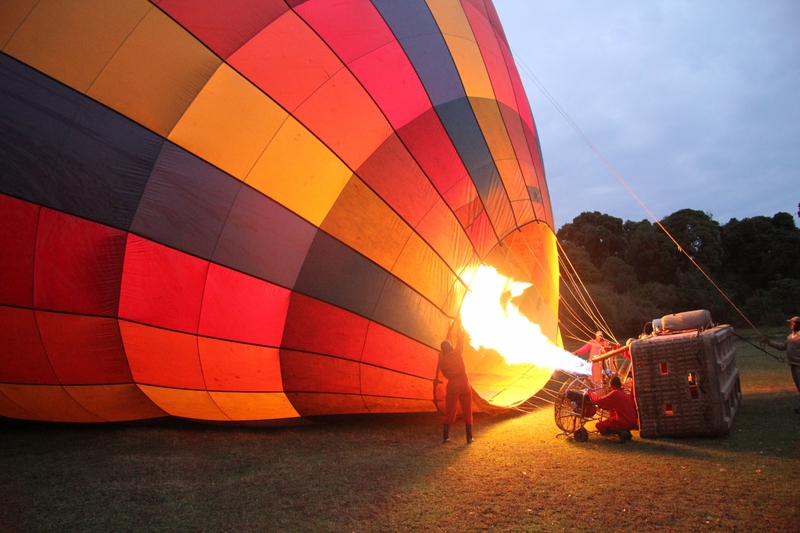 With the sun coming up over the horizon, we watch the balloon fill with life as it’s inflated from the side with large burners. As the balloon rises with hot air, and the basket rights itself, we clamber in and before we know it, we’re watching the camp get smaller and smaller – skyward bound! 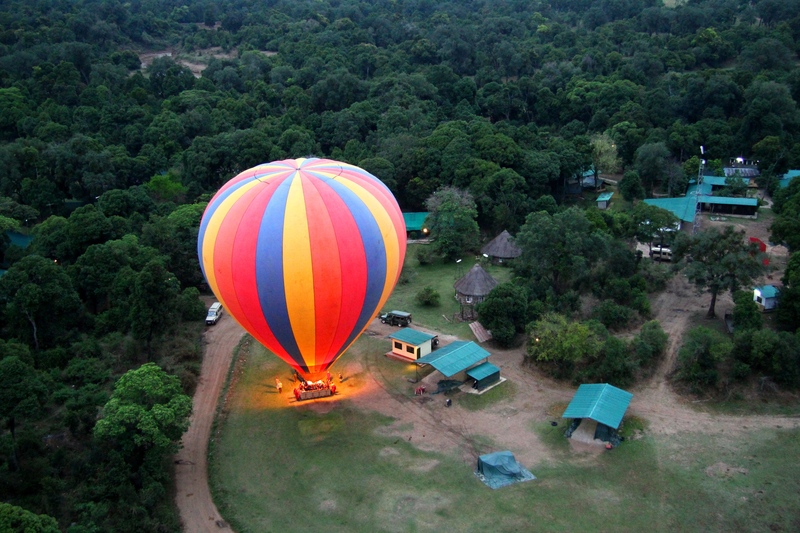 What a sight… With the sun rising over the Mara, we float along in the morning breeze. The only thing that breaks the silence are the burners which David opens up every so often. We fly low, literally a couple of metres off the ground at times. 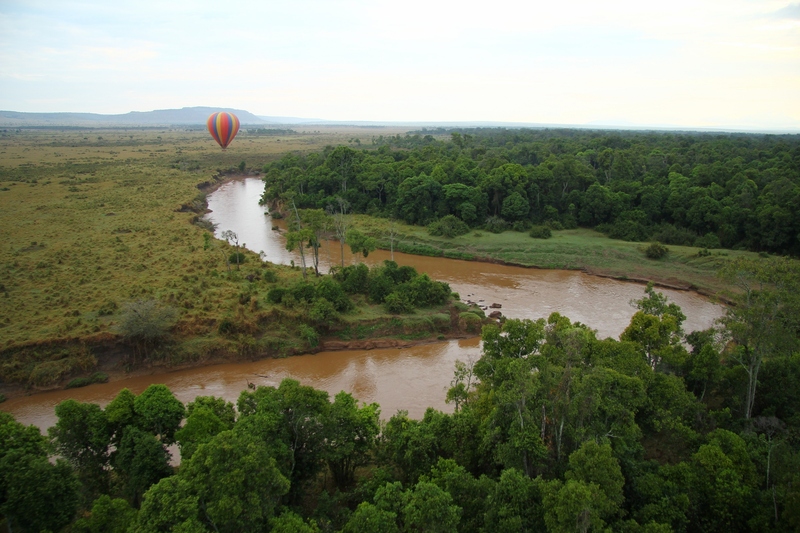 David tells me that we need to stay in this low channel for a particular wind system as it will eventually slingshot us around the up-coming bend of trees and allow us to fly over the Mara river. Any higher and we join a different wind system which will take us off into the escarpment to the right – and then we’ll have problems – no safe flat landing there… I trust his judgement! We sail over the grassy plains, watching wildebeest scatter beneath us, and for a short while, we get to cruise over the tree-lined river watching hippos and crocs completely unaware of our presence in the waters below. 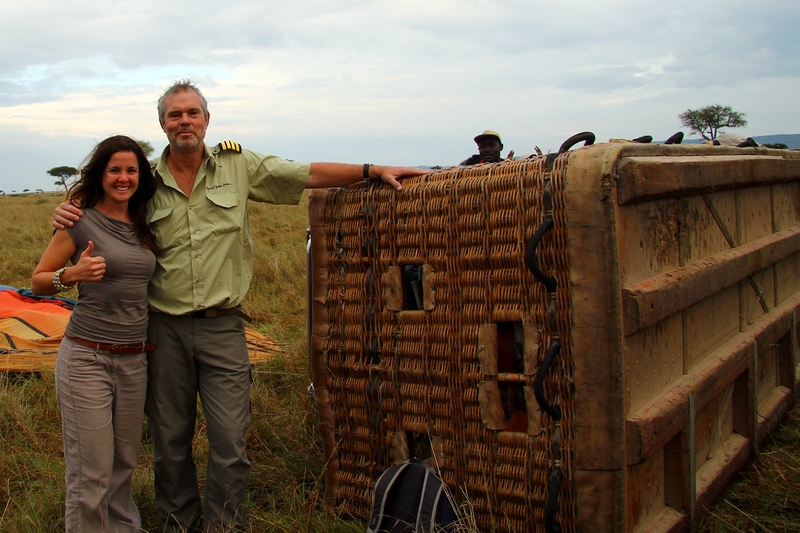 For the final ten minutes David cranks up the heat and we rise up high for our final view of the Mara plains below. Coming in to land, we all sit down and brace ourselves for the ‘bump and drag’. The landing is less than smooth, we kangaroo hop several times and plough through the tall grass until we come to a stop. David tells me later there was some other wind current near the landing sight that they hadn’t foreseen, which made the landing pretty technical… we had no idea. At least we didn’t hit an anthill! Collected in safari trucks, we are whisked off to a breakfast banquet in the bush. A beautifully laid table in the middle of nowhere, adorned with eggs, bacon, sausages, fruit and champagne! They even have a pancake chef to one side. It all seems a little surreal. We finish off the morning by taking a long game drive back to the camp. Yes I’m in Nairobi, yes I could have been in the centre at the time, but I wasn’t and so I shall continue to travel to these countries despite random attacks because you never know where next and it would be the greatest shame if we all stopped going places ‘just in case’. And so to the UK and Italy for Lizzy’s wedding – can’t wait to see my guys and girls again!